The ancient coin pictures above are present on Romanian coins through the kind permission of Mr. GLV. The coin belongs to the category of provincial Roman coins, sometimes called Greek imperial. 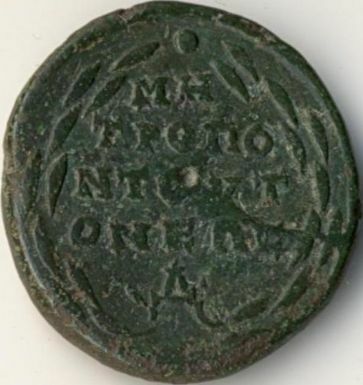 The coin corresponds to the description at number 2138 in the Moushmov catalog and is described in AMNG I at position 3281 (AMNG = Die antiken Münzen Nord-Griechenlands, B. Pick, 1898). Severus Alexander was son of Cassius Marcianus and of Julia Mammaea, being nephew of Julia Domna. At birth he was named Marcus Julius Gessius Alexianus Bassianus. In 221 AD he was adopted by his cousin, emperor Elagabalus. He was proclaimed Caesar, his name being changed to Marcus Aurelius Severus Alexander. Severus Alexander became emperor in 222 AD, following the death of Elagabalus. Until year 226 the empire was governed by his grandmother Julia Maesa, and after 226, by his mother, Julia Mammaea. In 234 AD Severus Alexander was assasinated together with his mother and the throne was occupied by Maximinus Thrax. The legend accompanying the portrait of Severus Alexander, AVT K M AVP CEV ALEΞANΔPΩC, is the Greek translation of the Latin IMP[ERATOR] C[AESAR] M[ARCUS] AUR[ELIUS] SEV[ERUS] ALEXANDER. The word imperator was translated by autocrator (autokrates in Greek meaning governing by one's self), IMP being replaced by AVT. Letter K following AVT is a short for Kaisar, Caesar. 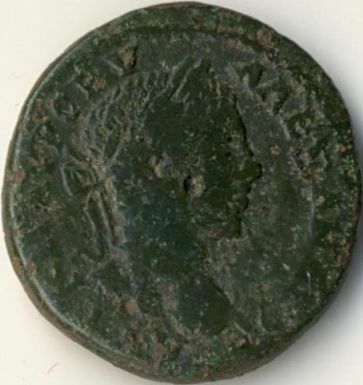 On the obverse as well as on the reverse some tiny dimples can be seen (also clearly visible on several provincial Roman coins present on our site). The signification of these dimples is not completely clear, the most common opinion being that they served a certain purpose during minting. So, they would be some sort of centering holes.